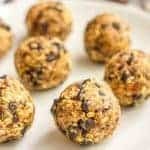 These 4-ingredient no-bake chocolate chip cookie balls take less than 10 minutes to make and are a great, wholesome snack! So I always need to have on-hand wholesome snacks prepped and practically waiting, which isn’t easy since I have a full-time job with deadlines and conference calls going on while they nap. 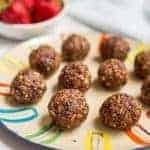 Some days, when I’m caught snack-less by my hungry little kiddos, I will whip up these no-bake chocolate chip cookie balls. 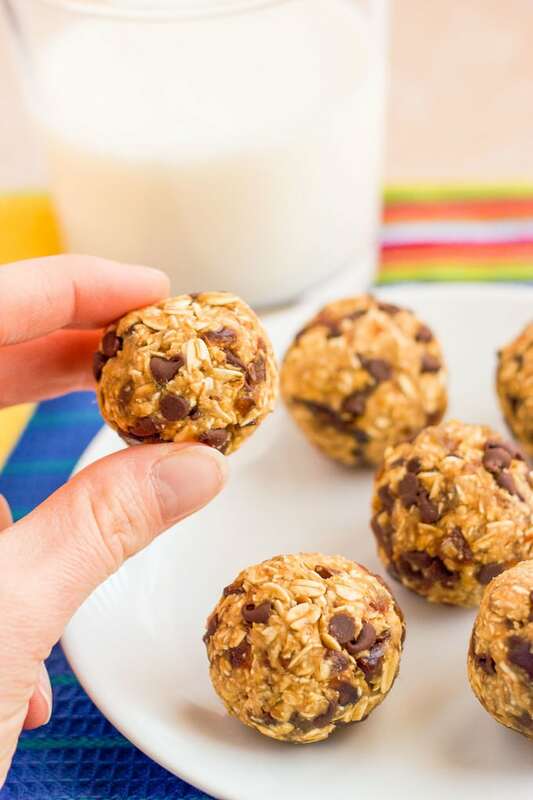 It takes less than 10 minutes to make these perfect little balls of soft, sweet, chewy, healthy chocolate chip cookie goodness. Get the kids involved! Depending on their age, they can fetch and measure ingredients, add the ingredients to the food processor, push the buttons to operate it, stir in the chocolate chips or roll these into balls. Older kids that can use a knife and be trusted around the blades of a food processor could easily make these by themselves. The amount of water needed to get these to come together will depend on how dry your dates are. Start small and add as you go. Wet your hands when you roll these into balls – that way the mixture sticks to itself and not to you. And these are gluten-free and vegan (if you sub dairy-free chocolate chips). 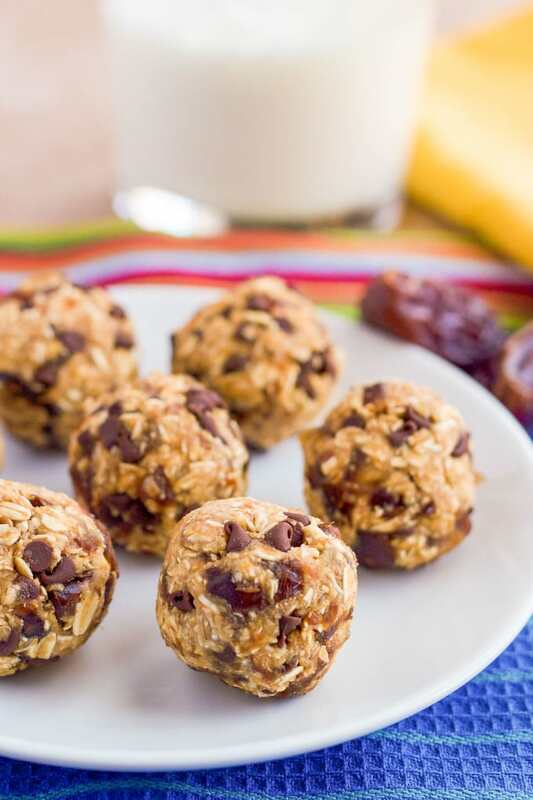 Next time you need a chocolate chip cookie fix, try this easy, healthy version. 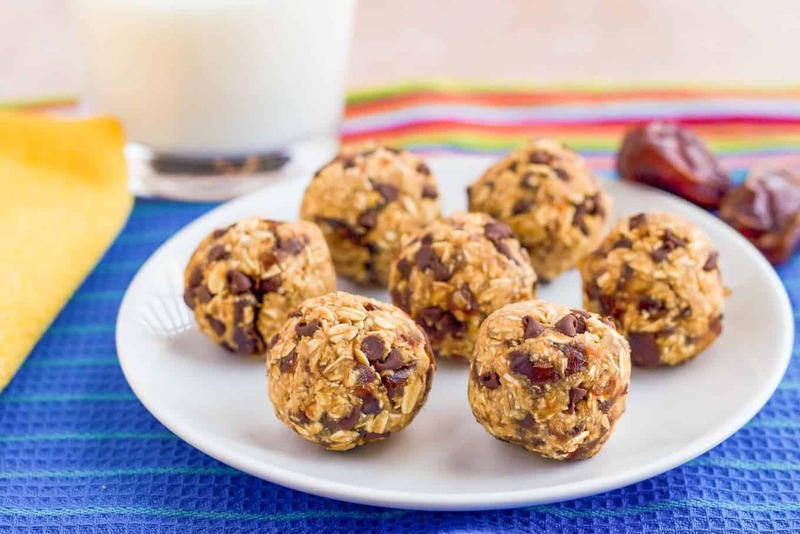 Healthy, 4-ingredient no-bake chocolate chip cookie balls take just 10 minutes! Add all of the ingredients, except the chocolate chips, to your food processor. Pulse, stopping to scrape down the sides as needed, until everything is well combined. Add extra water as needed to get the mixture to come together (see notes, below). Transfer mixture to a bowl and stir in mini chocolate chips. Wet hands and roll mixture into golf ball-sized cookie balls. Enjoy! I usually need at least 3 tablespoons of water to get the mixture to come together. It will depend on how dry your dates are. Add a bit at a time and wait till the mixture sticks to itself so you can roll it into balls. It helps to wet your palms with a little bit of water before rolling these up. 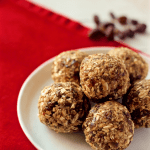 Store extra cookie balls in an airtight container in the refrigerator for up to 5 days. Oh, I love recipes like this, Kathryn! 4 ingredients and I could have these? Yes, please! Your kiddos are lucky! Pinning, of course, and looking forward to trying these soon. Have a great weekend!! Easy, fast and a cookie at the end?! Totally the best 😉 Happy weekend Dawn! Do you know if I could substitute at least some of the medjool dates with deglet noor dates? I have some of the Medjool kind from a recipe I made similar to this, but they’re so much more expensive than the Deglet Noor variety! Hi Marni! Yes, you can substitute. 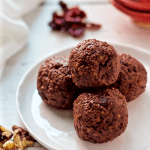 Deglet noor dates are a little less sweet and a little more dry than Medjool dates, however, so you may need some extra water to get the mixture to come together. You may also want to add a teaspoon or so of honey to sweetened them up. Try the mixture before you roll them up and adjust until they taste sweet enough to you. Would love to hear if you try them! Perfect for satisfying that sweet craving! I’ve been really into the energy balls lately, so I’ll have to give this one a try! I love dates! 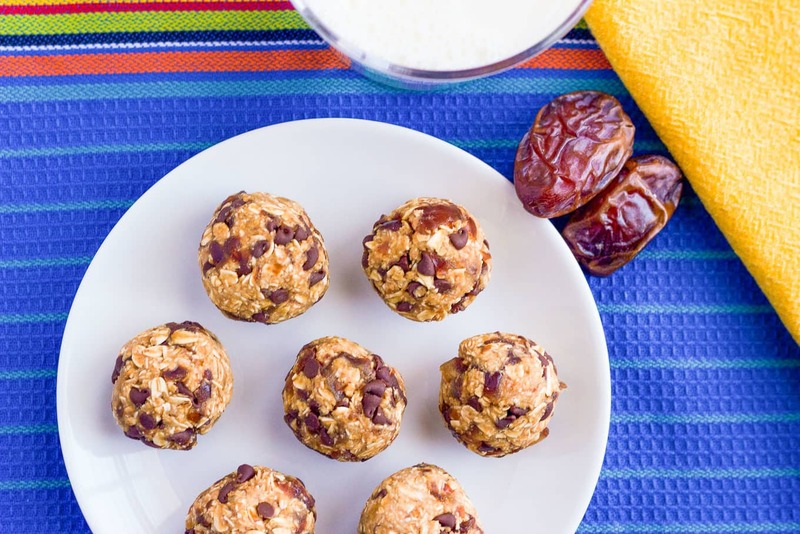 Yes, I love having energy balls on hand for a little afternoon pick-me-up and dates are a great natural sweetener. I hope you give these a try Holly! You can easily make them! Just melt regular chocolate chips or chocolate chunks and melt them and get a piper bag and pipe small chocolate chips out of the bag. Awww, it’s totally adorable your daughter wants to know what’s for breakfast the night before!! I used to ask my parents that — sweet sweet memories. 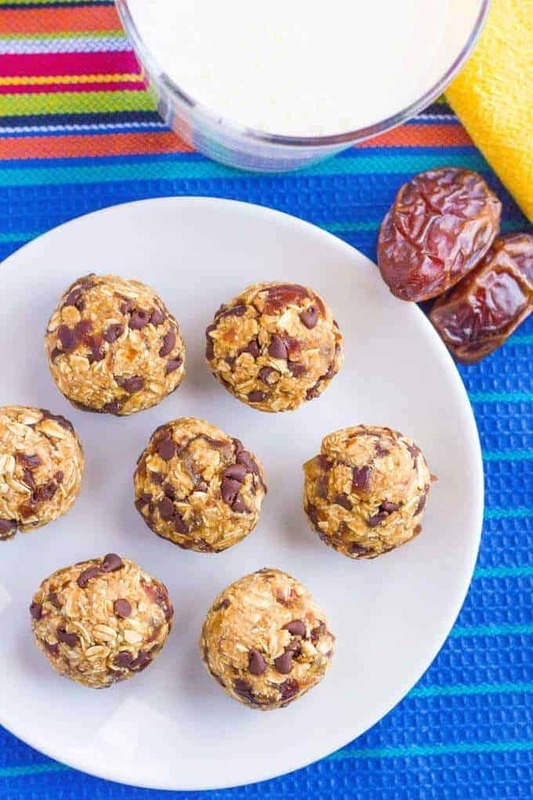 😉 These cookie balls look absolutely delicious, Kathryn! 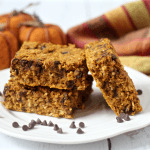 Loving that they are easy-peasy and no bake! Chocolate chip cookies without all the fuss? I’m in! Cheers, friend! She’s always wondering what her next meal is… can’t blame her, I’m the same way! And she’s always happy when these are on the menu 🙂 Have a wonderful week Cheyanne! Do you think I can sub quick cooking oats for the regular oatmeal?? Hoping! Hi Jacee! Yes, that substitution should work just fine here. Hope you give them a try! Love these cute little bites! Thanks for linking up with What’s Cookin’ Wednesday! Looks delish! I love anything with dates, but add chocolate! Thanks for linking up with us at Throwback Thursday! Such a great combination 🙂 And so easy! Thanks for hosting Mollie! Not a fan of dates. Is there something else that I could use? Hi Katherine! 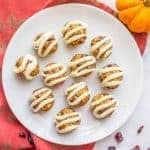 The dates are what sweeten these cookies and help hold them together in a ball, so I’m not sure that there’s a good substitute here. Sorry! I am thinking of trying them with dried apricots. In your nutrition info is a serving size one cookie? Hi MJ! I just went in and updated the recipe card to read that one cookie is a serving size to make sure it was calculating for that, so it’s all set now. Would love to hear what you think with the dried apricots! The good news is, though, these are completely naturally sweetened with the dates. No added sugar or sweeteners. I hope you like them Susan!